I have listened to Joe Dassin's wonderful songs when I was a child in my native Bulgaria and vividly remember my mother singing with the radio :);and must say they are truly inspirational! He was such an amasing singer with incredible soft voice and presence. Thank you for this site. I wasn't familliar with his biography but now I am and thank you for the lovely pictures too. I love French music and cinema and this site is a real treasure trove. Keep up the good work! if anybody is looking for JOE DASSIN CDs go to CDconnection.com . the site is safe and the prices are fair. I went looking for a copy of City of New Orleans in French and found much more. I discovered Joe Dassin. Amazing! I came across Joe Dassin par hassard, while on holidays a couple of years ago. Since then I became addicted to his music, c'est vraiment la fete pour moi. Amigos, soy un gran admirador de Joe, tengo un blog en el cual he puesto un link de èsta pàgina.Los invito a conocer mi trabajo y que disfruten de varios post que he realizado como un humilde tributo a Joe Dassin, el amigo de mi adolescencia con sus canciones. Un fuerte abrazo, desde Argentina. Very good site. I'll visit it again. listening to joe brings sunshine to my darkest days: a ray of light in this otherwise pitch-black world. merci, joe, merci. For fans of Joe, there is a very good cover version of his hit single "Et Si Tu N'Existais Pas" by the Finn Markku Aro. The tempo is somewhat faster, the overall performance "less" Chanson-like, and the vocalist sings in a higher register. Yet, I love the both versions! They support each other! 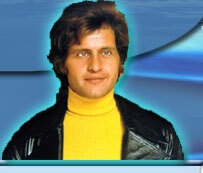 I happened upon this site, because I was looking for a place to download more Joe Dassin music. It is all but impossible to find on iTunes and Amazon, and in the States its even harder to find a CD album. I also have a strong passion for France and the French language. Which stemmed from the most amazing high school French teacher, who re-invented our course, and changed it to an immersion course that started in the 9th grade, about 5 years ago now. It wasn't 5 weeks in to the class and our teacher played "Aux Champs-Élysées" and ever since I've been hooked. Hi my name is Graciela I'm from Argentina,I love Joe Dassin from all my life.I've 51 years old.My best years were with Joe's music.my dauhgter is writing this mj we don't speak english,we hope you understand this mail.thank you.Graciela and Carolina from Buenos Aires,Argentina. Hi. I happened upon this website because I wanted to know more about Joe Dassin, whose music I had heard, and loved, at jango.com. But jango had no biographical information on him. What an interesting life story he has (and I have in common with him that I was also born in NY, and also love France). Before coming to this website, I knew nothing about him other than having heard his songs. Thanks for all the information. I think the german version of "champs-elysée" isn't very well. It was made to a song of love instead of a song about the champs-elysée.... and there are mistakes in grammar and spelling, too. Susanne, if you live in Germany (according to your email address) you can order Joe's CDs on Amazon.de. A few years ago I've seen some CDs in stores in Germany. And of course Amazon.com or Amazon.fr will have them. I have this dilema about one of Joe Dassin songs named: 'SALUT'. (also 'Uomo Dove Vai' by toto cutugno). I wonder who sings this version? Is it Joe Dassin? or maybe toto cutugno himself? Is it in English or french?